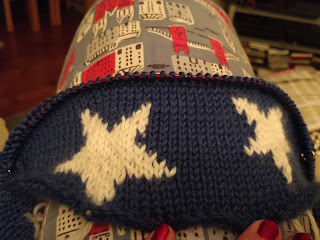 I am 23 rows into the yoke of the Wonderwoman jumper. Ooo. Wonderwoman. Yes, you can probably expect that every time. At one point I had a tangle of four mini skeins of the white, which had become irritating; but I've hit upon the trick of securing each one with a kirby grip to stop them from unravelling when not in use, which has seemed to work quite well. Hopefully that will help when I am juggling 10 of the buggers. This yarn is knitting up very soft, I am impressed. The stars look good and will look even better when blocked out, I think. I have to wash the blue swatch but there's been no dye transfer to my hands or the white yarn yet. I am a bit concerned it's going to be too small. I have got gauge, but the yoke is 58 rows so this is apparently more than one third of it. Meh. I should worry less.